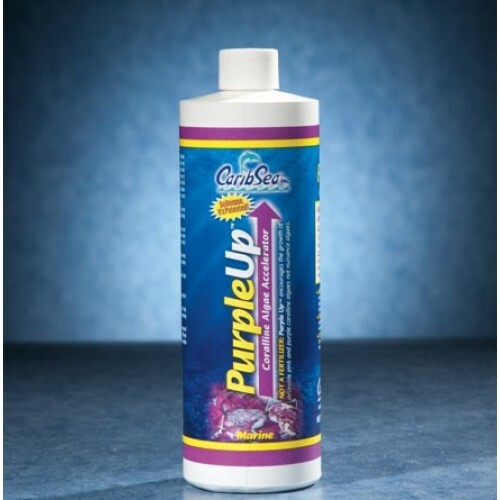 Iodine Replenishment: PurpleUp replenishes iodine, an essential element for coralline algae tissues that quickly becomes depleted in closed systems. Easy to use. One bottle of Purple Up replaces the typical multi-product recipe for successful coralline algae growth favored by advanced aquarists. Contains Super Sea Calcium, a natural calicum derived from pristine tropical oceans. Treats up to 4730 gallons. Shake well before use. Add 1 capful (5ml) per 50 gallons, no more than once daily. Place in the sump, near a powerhead outlet or any high flow area of the system for rapid dispersal. Some temporary cloudiness will appear. Check calcium levels regularly, adjust dosage to maintain calcium levels between 380 ppm and 420 ppm. Do not exceed 420 ppm on a regular basis or significant precipitation will occur. Important!! Wait at least one hour after using this product to test calcium levels or erroneously high calcium levels may be indicated.